Since 1974, Stock Manufacturing & Design has been a family run business with roots on the west side of Cincinnati. We have grown from one facility to four and are still growing with facilities in Cleves, West Chester, Fairfield, and Harrison. 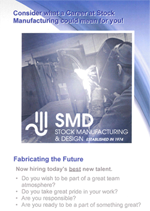 We have built an outstanding reputation as the region’s most highly respected fabrication shops. We are driven to provide the highest level of customer satisfaction in all our work through outstanding quality service. Our continual investment in technology and equipment provides us with the capabilities to produce the best the industry has to offer. and we welcome and encourage diversity.